Each revolution of a helical whorl contains 336 turns. 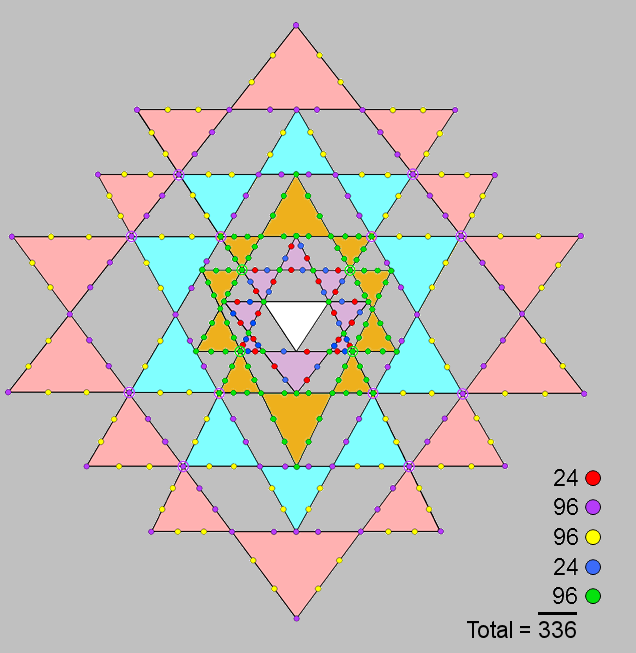 336 yods line the sides of the 42 triangles/tetractyses in the 3-dimensional Sri Yantra. They symbolise the types of geometrical elements in the 24-cell. (Circles denote yods directly below yods in the next higher layer of triangles. Hexagonal yods at centres of tetractyses are omitted for clarity). 96 green yods in the first & second layers either at corners of triangles or on their sides ↔ 96 internal triangles. It demonstrates the holistic nature of the 24-cell. The 336 yods manifest in the UPA/E8×E8 heterotic superstring as the 336 circular turns in a revolution of each helical whorl.